With contributions by Raymond Borens, Joachim F. Danckwardt, Thomas Ebke, Helmut Hinz, Annemarie Laimböck, Ellen Reinke and Timo Storck. The article presents some reflections on the respective approaches of Hermann Argelander and Alfred Lorenzer to psychoanalytic practice and theory of understanding. Hermann Argelander’s contributions reflect central points of application and theory: how does psychoanalytic understanding proceed, what are the decisive characteristics of its application in the initial interview. His concepts develop from an analysis of the particularities of the ›psychoanalytic situation‹ as generating ›situational‹, or in his alternative formulation: ›scenic evidence‹. The analyst’s experience of evidence within the psychoanalytic situation is mediated by a twofold mental operation: firstly, his identification with the patient’s transference as he experiences it in his unconscious counter-transference, and secondly, by his conscious metal and verbal considerations. Argelander’s approach to psychoanalytic practice also reflects problems of psychoanalytic theory, such as developmental and structural theory. He provides the reader with most impressing case examples and their methodological analysis. These last mentioned references to theory and methodology have not as yet been systematically taken note of in the scientific community, which would be especially desirable concerning recent controversial discussions of the importance of drive theory within psychoanalysis. Alfred Lorenzer for his part takes up the formidable epistemological problems of psychoanalysis by analyzing their context of justification. As a point of departure he proposes a critique of psychoanalytic symbol theory and, consequently, of language. He discusses Susanne K. Langer’s Philosophy in a new Key and Wittgenstein’s private language argument, to arrive at a psychoanalytic concept of symbol which meets the requirements of interdisciplinary discourse. He thus formulates his concept of ›scenic understanding‹ as the central modus operandi of psychoanalytic insight. Conceived in his theory of socialization, he defines the object of psychoanalysis as emerging from human interactions which are the basis of psychic representations. In his theory of interactions forms he conceives of these representations as based on psychic and bodily experience and their scenic organization. Like Argelander, Lorenzer advocates that psychoanalytic drive theory together with hermeneutics is basic to psychoanalytic insight. He thus arrives at his concept of hermeneutics of the body. Finally, he conceives of the epistemological foundations of psychoanalysis as a type incompatible to either human or natural science, as a type in its own rights. Concerning the nature of human understanding, I propose to discuss Lorenzer’s approach with Gadamer’s claim to the universality of the hermeneutic problem. Speaking about »szenisches Verstehen«, Lorenzer alludes in general to the analysis of transference and counter-transference. Thus, he does create an elegant and holistic term, yet at the same time he unduly limits its possibilities. The author’s arguments introduce a more comprehensive »szenisches Verstehen« and plead for this version because it does justice to the paradox situation of the analyst: he is torn between the spontaneous undeniable stake he has in the transaction, creative and intuitive ideas and his psychoanalytic technique. »Verstehen « – in connection with Argelander’s research – is seen as a hermeneutic process within the framework of speech. Taken together with »szenisch«, this says that it refers to the contradictions and riddles of a particular scene. This way of thinking opens up the theoretical possibility to interpret the workings of the dynamic as well as the procedural unconscious. In modern day concepts, which emphasize the importance of the actual relationship, sudden creative ideas and uniquely connected thoughts one can recognize this type of psychoanalytic process, even though they do not use the term »szenisches Verstehen«. The present paper aims at considering ›acting out‹ as action as trial thought. It can be thought of as a means of negotiating aspects of the transference relationship via confronting infantile with actual object representations. By doing so, a patient tentatively draws near to experiencing being related to others and the affects involved. This is to be viewed as a resistance towards the object relatednesss of actualized unconscious phantasies and conflicts, while at the same time it is bringing to experience that relationship with the object. To elucidate that, a history of the term and related concepts is presented, including a metapsychological discussion and an attempt to discriminate between acting out, acting in, role-responsiveness, Szene (scene), Handlungsdialog (action dialogue), enactment, Inszenierung (staging), performance and Verwicklung (entanglement). The constriction of the analyst in the counter-transference is containing a »kernel of truth«, of a reality actualized in the Here and Now. This is referring to the delusional conviction of the patient of the facticity (rather than its mentalized conceptualization) of his perceiving of the analyst. It is furthered by the fact that the patient partially perceives quite correctly that the analyst is being tempted to adapt his way of being to the genetically determined ways in which the patient has experienced object-relations. Such an »identity of perception« regarding the actually experienced and the remembered is corresponding to as well as brought about by a reduction of reflection and thought crucial to any critical perception. »Identity of thought« is essentially based on an activation of the inner function of the position of the father and of triangularity which can come about by a process of realizing the difference between the archaic ways of perceiving the analyst and what he is actually representing to the patient as opposed to his analytic function. In this paper the acting out of the analyst due to his countertransference constriction is demonstrated to illustrate these dynamics of involvement as well as the respective process of gaining an understanding which is understood as an essential »kernel of truth« in regard to a central aspect of relating in the biography of the patient: The reactualization of a father that was experienced as sickly weak and corrupt. 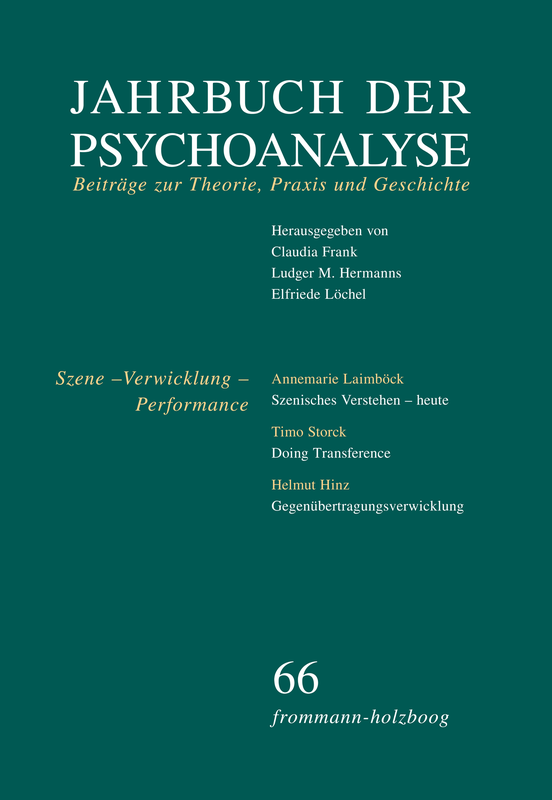 With the aid of a detailed description of a clinical sequence the author of the present article offers a theoretical discussion and definition of the concept of performance / Performanz that was first introduced in 2006 into the psychoanalytic discourse of the German speaking areas. Based upon this clinical sequence the attempt is made to examine the concept of Performance / Performanz in terms of its usefulness for the psychoanalytic clinic and to compare it, for differential diagnostic purposes, with some of the relevant clinical concepts commonly used by the English speaking psychoanalysts, for instance: acting in, acting out, intersubjectivity, role responsiveness, countertransference enactment, counterenactments, interpretive attitude, play and enactment. Furthermore, the author undertakes a close examination of the connections that exist between the concept of performance / Performanz and the various relevant clinical concepts generally applied by German psychoanalysts like Kommunikation and Inszenierung unbewusster Regungen [enactment of unconscious impulses], Inszenierung der frühkindlichen Neurose in der Form von Handlungen [enactment of infantile neurosis in the form of action], Inszenierung der archaischen Matrix des Ödipuskomplexes [enactment of the archaic matrix of the oedipus complex], szenisches Verstehen [scenic understanding], Handlungsdialog [action dialogue], Handlungssprache [action language] and Handlungssubstitution für verbale Kommunikation [replacement of verbal communication through action]. The development and the history as well as the communicative, the explanatory and the use value of the concept of performance / Performanz are each considered and discussed in detail with respect to their clinical relevance within today’s widely expanded spectrum of improved and progressive therapeutic approaches in the treatment of what had seemed to be hitherto untreatable pathologies. Proceeding from the fundamental difference between imaginary and symbolic interpretation the psychoanalytic act is defined as the event that allows the transition from Id to Ego, but not to the ego (moi) but to I (je) which is the subject of the unconscious. By using clinical examples the paper aims to demonstrate how all the procedures that intend something other than the »exchange of words« prevent the psychoanalytic act. Finally the difference Lacan makes between acting and passage à l’acte is emphasized. The historical and systematic ties between the discursive traditions of psychoanalysis and philosophical anthropology have not yet undergone satisfactory research. In this situation, the paper exposes a motive of thought that is reflected both within Jacques Lacan’s structuralist refraction of psychoanalysis and within Helmuth Plessner’s philosophical anthropology. This motive concerns the figure of the homo absconditus, the essentially unfathomable man. As the paper shows, the anthropological explication of this figure presupposes a specific problem discovered by Freud in his Project for a scientific psychology from 1895. Against that background, the essay examines and compares the two distinct anthropologies of the homo absconditus developed independently of each other by Lacan and Plessner. In the end, the comparison is narrowed down to the question of the dissimilar »ethics« that spring from the topic of the homo absconditus in both of the discussed cases.